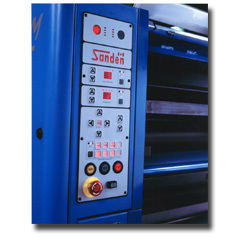 Sanden Machine Limited is the world's leading manufacturer of state of the art web printing and collating machinery for the direct mail, business forms, packaging and specialty web offset printing industry. State-of-the-art make-ready efficiency is accomplished through the programmable Sanden Computer Control System SCCS, with network-ready data management program modules. Features such as independent unit drive, automatic wash-up, 360 degree registration with unit and gap zero simplify job start up and reduce time and paper spoilage. Precise colour consistency through the speed range is achieved through fully programmable ink fountain, ductor and water controls. Quantum presses utilize a filtered recirculation oil bath system, rigid unit construction, oversized journals and dual tapered roller bearings, AGMA Class 11/12 gears and direct drive features that contribute to its high-speed performance and Sanden's legendary registration. 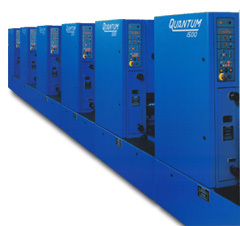 Designed for medium run, high colour forms and commercial printing applications, the Quantum-1250CM features rated speeds up to 1,250 fpm; offering 150 inches of lineal ink storage, 4 oscillator rollers, and 3 ink form rollers. Web widths range from 15-27 inches and variable print repeats from 14-28 inches. With web widths ranging from 21-38.5 inches and variable print repeats from 17-36 inches, no press in its class can compete with the performance of the QUANTUM-1500. 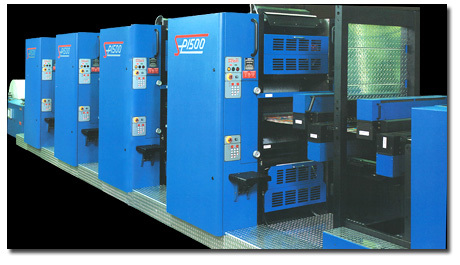 This truly versatile commercial printers' press offers top sheet fed quality products at speeds up to 1,500 fpm, with over 200 inches of lineal ink storage, 4 oscillator rollers and 4 ink form rollers. Even your most challenging work will have a true sheet fed quality, but with the paper savings and efficiencies of web offset technology! 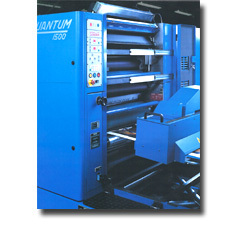 The Quantum 1500SP is a servo-driven, variable-size, blanket-to-blanket, perfecting we press designed for heatset or UV applications in the commercial, direct mail and specialty printing markets. At speeds up to 1500 fpm, this flexible commercial web boasts sheetfed print quality, but with paper savings and throughput of web offset technology. The 1500SP is an ideal alternative to the 28" or 40" sheetfed colour process market for run lengths as low as 5,000 - reducing manufacturing cost per thousand by 30-50 percent. The Quantum 1500SP's versatility, as compared to traditional fixed-sized perfecting web where throughput and high utilization are necessary to maximise profits, can be leveraged to improve efficiency and reduce costs. The press can produce both short grain products, 17 3/4" cut-off, and long grain products, 22 3/4" cut-off simply by using inserts sized for each format. Furthermore, if 17 1/2" or 17 1/4" is a better repeat size and reduces paper waste per impression, that size can be purchased instead. Additional insert cards can be purchased at any time, as market needs change. The Quantum 1500SP is designed to produce high quality signature products which can be supplied in various configurations, e.g. with former, plow, jaw and chop folds in a variety of finished sizes. Sheeted products are available in cut-offs from 7" to 28". Web widths are available from 21" to 38 1/2". Rated at speeds up to 2,000 fpm in a 38.5 inch wide format, this specialized, high volume applications press delivers the range and quality of products your customers demand. Press line features include over 200 inches of lineal ink storage, 4 oscillator rollers, 4 ink form rollers and continuous ink ducting. For the ultimate in long run performance with no sacrifice in commercial printing quality, there's no better choice than the Quantum 2000XR. 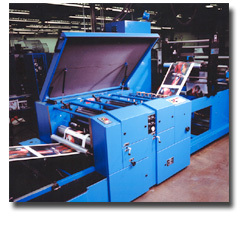 The SCCS system is a fully programmable, open architecture, Windows based press operating system. All major press control functions are remotely controlled from the system's main console at the press delivery end. Circumferential and lateral register moves are standard features executed in exact one thousandth of an inch. Programmable ink and water balance sweeps ensure consistent quality for each colour, even while accelerating through the speed range. The Compu-Set Q1 command center with touch screen console offers complete one-step control of all press functions. Easy-to-read individual control screen windows appear, with high resolution graphics, for each press function selected. The point and touch Navigator is designed with the operator in mind and provides the most user-friendly control system available. In all, over 70 press functions can be enabled and stored on the systems hard drive or disc and are easily recalled for rapid set up on repeat jobs. The SDMS System is a module based software suite of management control solutions. 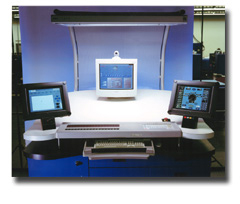 The base module enables real-time network access to the press, allowing authorised personnel to access job data including make-ready time, current count, impressions remaining, running speed etc., all from a modem equipped computer. Other modules include a password protected pre-programmed on-line maintenance management system with automated sentry for prompting of necessary maintenance requirements and logging their completion. A real-time diagnostic system alerts the operator of press deviations and automatically identifies those corrections when completed. A press operations log, designed to assist management with production and scheduling issues and a parts manual with zoom-in parts locator is also available.